The Indian Robin, Saxicoloides fulicata, is a small passerine bird that was formerly classed as a member of the thrush family Turdidae, but is now more generally considered to be an Old World flycatcher, family Muscicapidae. It, and similar small species, are often called chats. 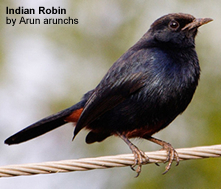 The Indian Robin is an insectivorous species which is a resident breeder in Pakistan, India and Sri Lanka. It is found in scrub jungle and other open habitats including around habitation. It nests in a hole in a wall, tree-stump or bank, laying 2-3 creamy white eggs on a pad of grass lined with feathers or hair. Only the female incubates the eggs. This species is 19cm long, including the long cocked tail. It is similar in shape to the smaller European Robin, but is longer-tailed. The male of the race found in southern India and Sri Lanka, S. f. fulicata, is completely glossy black apart from a white shoulder patch and a reddish lower belly. Males of the northern race S. f. cambaiensis have a grey back and crown. Females are dark grey above and paler below. This is a common and tame bird. It is terrestrial, hopping along the ground with cocked tail. The male sings a few melodic notes during courtship.